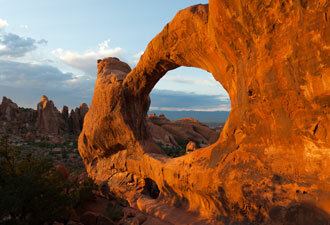 Everywhere you look, arches and balanced rocks stand in tribute to the slow march of time. Rainbow swirls of sandstone defy your imagination and delight your senses. Have you found an ancient ice cream parlor for giants? Did you stumble into a fairytale? Or, have you traveled across the cosmos to a bizarre Martian landscape? When you journey to Arches National Park, the colors, textures, and formations create a dreamlike setting unlike any other in—or out of— this world. More than 2,000 sandstone arches (some as long as a football field, some no more than three feet across) dot the desert skyline just north of Moab, Utah. The formation of these rocky spans began over 300 million years ago, when southern Utah was covered by an ancient, salty sea. This sea evaporated and refilled several times in the past, creating a vast salt deposit beneath the modern-day park. For millions of years, this salt layer was covered by thousands of feet of sand and mud sediments from nearby mountain ranges. The sediments slowly turned to colorful stone as the salt bed below Arches began to flow under the weight of the overlying rock. This movement caused the surface rock to buckle and shift, thrusting some sections upward into domes, dropping others into surrounding cavities, and causing tall, vertical formations that look like orange shark fins cutting across the horizon. Within the fins, acidic rainwater dissolved calcite cement in weaker rock layers to form holes and arches, much in the same way acidic foods can weaken tooth enamel. Today, Southeastern Utah contains the highest concentration of natural arches on Earth. Arches National Park protects these awe-inspiring arches and structures along 45 miles of winding roads and 20 miles of stunning hiking trails that offer amazing views of the desert and nearby La Sal Mountains. Come visit and enjoy a variety of activities that will challenge, refresh and inspire you. 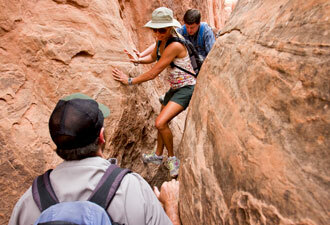 To discover more about the ethereal shapes and landforms that make Arches National Park unique, attend a ranger program to learn about the geology, biology, or history of the park. Admire the red-rock glow of Delicate Arch at sunset. Explore the network of deep fin canyons in Devils Garden, or take a quick stroll through the easy trails at awe-inspiring Windows and kid-friendly Sand Dune Arch. For those with limited time or mobility, many viewpoints and accessible paths provide spectacular overlooks of some of the park’s most famous features. Interested in camping? 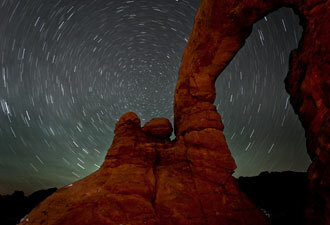 Make reservations online for the Devils Garden Campground, where you can enjoy an evening program in the shadow of Skyline Arch or fall asleep under some of the darkest night skies in the Southwest. Just four hours south of Salt Lake City and five miles north of scenic Moab, Utah, Arches National Park is easily accessible for day trips and multi-day adventures alike. For directions and information about how to best plan your trip, visit our website. An out-of-this-world experience is waiting for you!